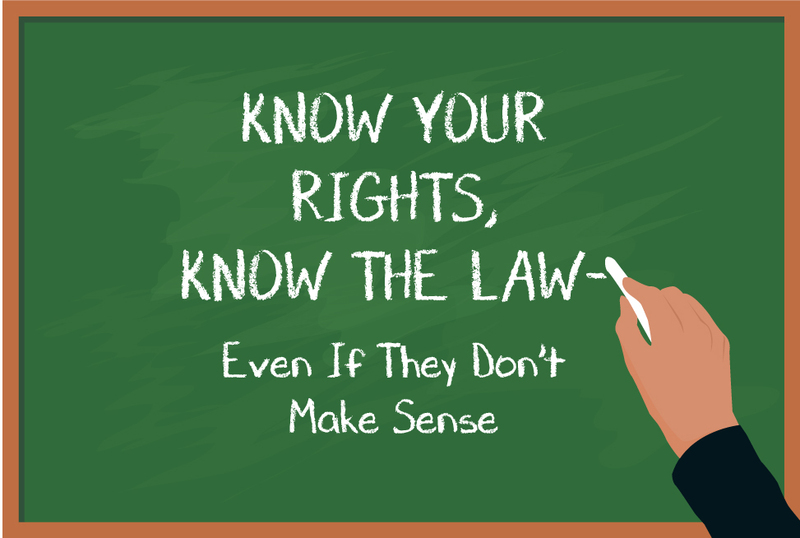 Home » Blog » Criminal Law » Know Your Rights, Know The Law – Even if They Don’t Make Sense! We meet people from our community who need help posting bail for a myriad of reasons, which leads to a unique perspective: sometimes people don’t even know they’re headed for trouble until it’s too late! You may think you’re doing everything necessary to be an upstanding citizen, but sometimes the law can catch you off guard! They say that “knowing is half the battle” and “knowledge is power.” To that point, it’s a good idea for everyone to be aware of new laws when they take effect, and to even be aware of some old laws you’d never imagine existed to begin with. The best way to avoid an arrest is to obey the law. But, did you know that in Carmel, you’d better have a reasonable fashion sense? 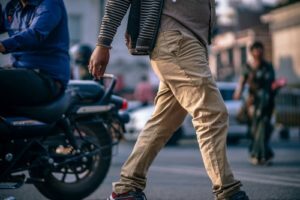 Apparently, it’s illegal to wear a jacket and pants that don’t match if you’re going out in public. Tough question: do they train officers to know what to look for in an outfit mismatch? Never wear mismatched jacket and pants in public if you don’t want to be jailed! Sometimes, people’s judgment may lapse when they’re in a rush. If you’re out on the town in Riverside during lunch break, you might want to stay clear of trouble and either eat your lunch in the office lounge or make time for a sit-down meal. It’s against the law to carry your lunch down the street between 11 a.m. And 1 p.m. If you’re launching your new brick-and-mortar start-up company in Indian Wells, it’s likely you’ll be looking for ways to advertise on a shoestring budget. Whatever you do, be careful to obey the law; don’t try to lure in customers by playing the trumpet! That’s right; it’s against the law. Who knows whether these are in full enforcement, and whether it will ever become a priority to remove antiquated laws that may have had their purpose at some time. But, what about new laws that come into effect? In some cases, ignorance may not be bliss. Perhaps one of the most relevant new laws to be aware of deals with the proper use of wireless phones. You can only use your smart phone/cell phone if it is mounted. But, what makes this a particularly tricky law to enforce properly is the restriction that the phone can only be operated, or touched, in order to activate or deactivate a feature. It’s not clear how an officer decides why you’re swiping left or right, and how they will be certain you weren’t completing a sentence for texting at a red light, but if you want to avoid confrontation, sometimes taking care of the smaller details prevents running into bigger trouble as a result. Another new California law may appear less restrictive at first glance, but it certainly merits using common sense. Hair Salons and Barber Shops are now allowed to serve free wine and beer until 10 p.m. This might sound like a great new perk, but make sure you have a plan if you’re going to be drinking. It doesn’t take a lot of alcohol to fail a a DUI test, and that is even more true on an empty stomach. Make sure you have other activities planned before you have to drive, or work your schedule around a convenient Uber driver to cater to your needs. Whether the law is too old to remember or too new to be aware of, we all hope to avoid trouble wherever we can. The more you know, the more you can plan to stay safe and avoid running into trouble with the law. But, if you happen to get caught off guard by one of California’s tricky rules and regulations, make sure to have our contact information at hand. If you need help with your situation, call Bail Bonds DIRECT any time at 800-880-8380.